I only recognize a few of the marquee names though that was Colin Farrell at my local bakery. (He's also shooting here.) George Clooney is apparently very obliging with fans. 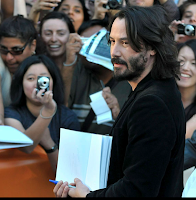 Keanu's growing his hair. This year, I seen some people so exceptionally formed that it reminds me of what our species is capable. Example, left, Italian actors Magreth Made and Francesco Scianna, stars of "Barria", from "Cinema Paradisio" director Guiseppe Tornatore. A guy who looked like this showed up at my yoga studio, unrolled his mat next to mine, and I kept thinking, this person is perfect. I have no idea if many of these stunners are actually in films; the city is overrun with producers, paramours, stylists, publicists, a lot of them with stellar looks. Carrie Mulligan: Award for Young Ingenue in LBD. Hepburnesque. Somebody always does it, and she does it very well. Look closely to see elegant drape-and-fold of her dress (designer unknown); note ruby shoes. Jennifer Connolly: Got it, wearing it (Bottega Veneta). A larger image would melt your screen. Drew Bar rymore: That's a lace overlay on her Alexander McQueen dress, daring, downtown and eccentric, like her. Some misguided attempts to be 'different' were bizarre, but Drew nailed an extremely elusive look. Love her black-tips-on-blonde, a look my hairdresser GF Ingrid rocked several years ago (in her late 50s) with burgundy tips on light brown. 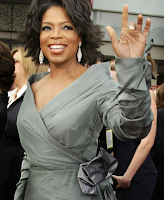 Oprah, svelte at the "Precious" premiere (I would say corseted within an inch of her life based on other shots of her at TIFF), and those earrings are many carats of real. She knows the effect of the portrait neckline, and wears it often. Julie Christie: Dig the slim animal pants; she is attending a screening of "Glorious 39", not a premiere. Glorious indeed. Sarah Ferguson, The Duchess of York: Not flattered by tarty push-up, awkward sleeve detail, scraggly hair. Calling Trinny and Susannah! Among the worst-dressed: Young Vancouver actress Valerie Tian. Those twin pillowcase things are pants, worn with leggings. Maybe OK for a gardenburger at the local café but not on the red carpet. But what caught my eye is her pose. Compare her body language to Carrie, Jennifer and Drew. Get thee to Holt Renfrew, Valerie, you have three more days of Festival left. Closeup of Drew's dress: see how the tattoo-pattern lace glides up the bodice? She's here to premiere her roller-derby film "Whip It", also starring Ellen Page. Oh, almost forgot. The czar of sexycool, Tom Ford about owns the Festival. metscan: If you find Jennifere disgusting, then you should have seen Robin Wright Penn then. Tom is sleek , maybe it's the red. Some people are so improbably gorgeous that my husband and I refer to them as being from "the planet of the beautiful." I'm talking about people who look like that sans stylist. HuffPo had a shot of Jennifer Conolly's dress showing that it was quite see through on top, and of course she had no bra on underneath. But it's a pretty cut and color! Love Drew's dress...so fun and quirky like her. Last Saturday was out with the Purse Forum LA gals, and ran into the actor who plays "Alex" on Grey's Anatomy in Hermès (shopping with his mother!). What a gorgeous hunk of manhood! Even in a white cotton tank shirt and silly hat, he looked amazing. Sometimes when you see celebs though they just look like a good version of the rest of us if they're not made up and dressed up. What fun! A friend of mine shopping in Toronto a few years ago in a small boutique tried on a coat that she was assured had been put aside for Diane Lane-- they had another one made up for her and she chuckles about having a copy of Diane's coat. It's gorgeous on my friend, and, if the story's not just apocryphal, probably gorgeous on Diane as well. I love Drew's dress. It's unusual, but still so beautiful. It reminds me of the black and white dress worn by Miranda Richardson at the end of Tim Burton's Sleepy Hollow, which if I remember right was based on a Klimt painting. I love Drew's dress. Jennifer Connelly is gorgeous and probably looks amazing in the dress. I know I must be getting old because I increasingly wonder what happened to dressing with a little discretion. Still it must be amazing to have all these people in town. I love the TIFF! Many celebs whom I find gorgeous in photos or on screen look a bit too... tiny for my tastes when I see them in real life. Like wee, miniature, perfectly-formed versions of humans. Not to say that Tom Cruise isn't still handsome at 5'4" but somehow I'm usually not so much struck by celebs' beauty as by their diminutive measurements. Drew apparently ditched the "Whip It" party and decamped to Sweaty Betty's, a local semi-dive, where she served drinks to regulars. I find such beauty fascinating. Drew stays true to form and pulls it off. Jennifer Conolly is one of those drop dead gorgeous types. I remember Johnny Carson once remarked years ago that he would love to spend just one day being able to play tennis like Jimmy Connors. I remembered this comment while watching Project Runway last week. Just to spend one day looking like Heidi Klum would do it for me. Or Jennifer Conolly. What must it be like really to walk around looking like that? Pseu and Mardel: Did not realize Jennifer C. was so um, revealed till I saw a closeup, yikes. Pseu, My sons like to go to Hermes too- seriously. Maybe this will instill a sterling work ethic. materfamilas: I so admire Diane Lane, have not seen her in a film recently. CompassRose: The most interesting dress of the festival! Maggie: Yes- or maybe a day as George Clooney just to see what it's like. Oh, my God. I LOVE Drew's dress. I just... I just want to applaud. Drew looks super. I love her. Love that hair last night--saw her on Leno. I love Drew's dress - and the fact that she stays quirky! Jennifer Conolly is just ridiculously beautiful ... sigh.